is designed to increase riding comfort and to avoid the wing flying into someone. Always use the leash in crowded areas and in high wind conditions. 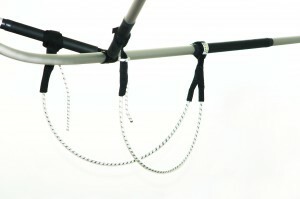 Attach the leash on the boom at the front part of the y-piece and the cuff around your hand. has been designed by our best riders to meet their needs. The double-sided V line stabilizes the wing when hooked in. The V concept makes it possible to jump with one hand or no hands on the wing. The racers appreciate the possibility to use the leeward side of the lines for more power in light winds. The V-line is easily adjustable for different lengths, the maximum lenght of the line is 103cm/ 40.5? with adjustability of 10cm/ 3.9?. is better suited for travel than the standard wingbags, as it is padded for added protection of the wing. Also the measures have been extended, to fit some spareparts, harness or whatever smaller items usually carried with the wing. 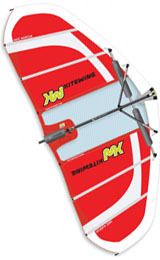 The length is suitable for all wings, also the Wavewarrior 75.